This is the first triangle shawl I designed with a knitting technique that is similar to a mitered square but with a little twist. It isn't perfect but pretty and wearable. It turned out a little larger and it has a longer wing-span than I expected. It would work well when wearing it as a head scarf shawl because of the extra long wings to wrape around neck and shoulders. 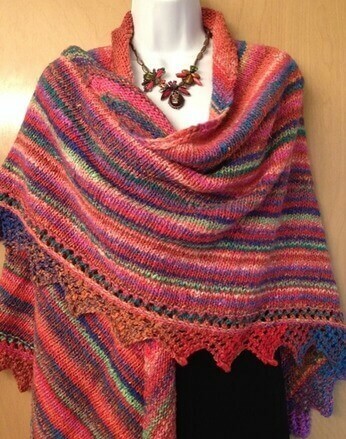 Triagle Shawl showing here looks quite lovely when wrapping around body. At first, I didn't plan to add any border to it because I afraid it would be too much or to busy. Then when I was done with the body it looked a little empty. A little border wouldn't hurt, I thought. Looking around and I found the perfect lacy edge for it and the rest is history. I am very disappointed with this Noro yarn because there are so many spots where the yarns were joined. It is very annoying when you get interrupted by little knots and have to stop and fix it. With the prize this high (almost $20 per ball), there shouldn't be doing this to the buyers. I'm not going to buy Noro yarn for a very long time from now on. I still do love the color though. 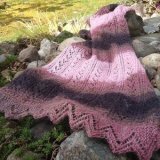 I tried to come up with a name for the shawl but couldn't. Maybe some day something will jump at me. 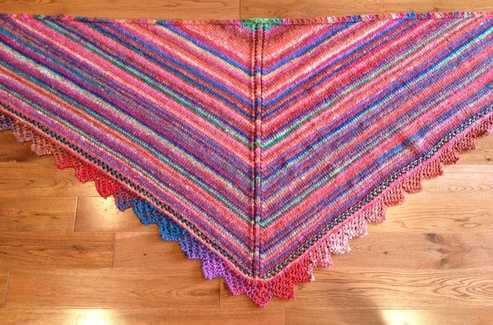 For now we'll just call it "triangular shawl with lacy edge". 2. 36 - 40 inches Circular knitting needle size US # 9 (5.5mm). I used the longest cable on my interchangeable needles set. CO 316 sts. Knit one row and at the same time place a marker before the 2 center sts (158th and 159th sts). 1st Row (right side): K2, SKP, K to 3rd st before the 2 center sts, sl 1, k2tog, psso, yo, k 2, yo, k3tog, k to the last 4 sts, k2tog, k2. 2nd Row: k2, p2tog, p to the last 4 sts, SSPtb (slip,slip, purl through back loops), K2. **you can see how I did ssptb and other sts mentioned on 1st and 2nd rows on the video below. Next row (right side): K2, [Sl 1, k1,psso] twice, [k2tog] twice, k 2. Next row: K2, p2tog, SSptb, k2. BO all sts and at the same time slip the 1st st and k2tog the last 2 sts during BO. 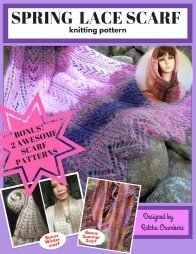 Make Eyelet Lace Edging until it is long enough to fit the bottom end of the shawl. Then sew the edging to the shawl to finish the piece.